As I type this newsletter, I am up north for the weekend with my sister for a little break and some bonding time. Sitting by the lake and listening to all the sounds northern Ontario has to offer, everything seems to run at a slower pace and the simple things of life seem to shine through. The theme of this newsletter is to simplify. After working with thousands of clients for over a decade in the weight loss world, I have realized that living well and feeling good does not have to be a complicated thing. If fact, the more you simplify your diet (and life! ), the easier achieving optimal health becomes. Move every day for a minimum of 30 minutes. The body was not designed to be sedentary. To keep your energy up and stress levels down – you must move. Hydrate all day long with water or herbal teas. To remain alkaline, add chlorophyll or fresh squeezed lemon to your water daily. Watch your grains and sugars. I am not suggesting you remove grain from your diet altogether– but try to minimize your consumption (especially in the evening). As far as sugars go, if you do want to indulge, refer to my CityLine blog below for some healthier options. As Canadians, we need to enjoy every moment of summer and warm weather. I wish you long wonderful summer days filled with good food, lots of play, and good times with those you love. Looking for some healthier summer treats? Square Snacks Cocoa Cravings 3 PM Snack - This delicious “pop in your purse” snack is a balanced option when your 3pm cravings hit. Developed by a nutritionist and with only 110 calories per bar, this tasty treat is loaded with iron, fibre and healthy fats. To top it off – the product is 100% Canadian. Two thumbs way up! ZOKU Popsicle Maker – 7 minutes is all it takes to make your own popsicles at home. The patented ZOKU Quick Pop Maker not only freezes smoothies, fruit purees, or Greek yogurt right before your eyes, it's also releases the pops easily. No more fidgeting with molds under hot water while your creation melts! 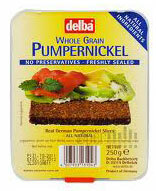 Delba Pumpernickel Bread – Authentic pumpernickel bread owes its dark hue to whole rye kernels that give it extra nutrition and a lower glycemic index than other breads. Oikos Key Lime Greek Yogurt by Dannon - This new flavor of Oikos yogurt is one of my new favorite indulgences. With at least double the amount of protein found in regular yogurt, you know Greek yogurt is a great choice to fill you up. Eaten on its own or blended with ice and frozen to make a creamy popsicle, this delicious flavor is a wonderful summer treat. Cherries - There are so many reasons to love these super fruits. Besides being low-cal and high fiber, their potent antioxidant content is linked to reducing gout and arthritis. And, did you know that cherries also provide melatonin, the brain hormone that regulates sleep? All these benefits make cherries a great choice for fuelling up during your active summer. Choose large, plump cherries with smooth, shiny skins and be sure to eat them right after you wash them. Check out the Cherry Pecan Salad recipe below! 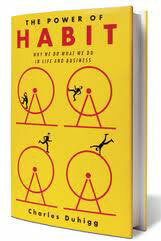 The Power of Habit - A young woman walks into a laboratory. Over the past two years, she has transformed almost every aspect of her life. She has improved her nutrition, quit smoking, run a marathon, and been promoted at work. The patterns inside her brain, neurologists discover, have fundamentally changed. As Charles Duhigg shows, whether it is weight loss, quitting smoking or earning more money, by harnessing this new science, we can transform our businesses, our communities, and our lives. Whisk maple syrup, vinegar, oil, pepper and nutmeg in a large bowl. Add spinach, Spring mix, and cherries; toss to coat. Divide the salad among 4 plates. Top with pecans while they're still warm from being toasted. Combine all ingredients in a large bowl. Cover and chill for at least 2 hours. Whisk mustard and honey in a bowl until smooth. Combine chicken, a few tablespoons of mustard mixture (save some for basting), Herbamare and pepper in a bowl. Mix well, then form into four 1-inch-thick burger patties. Lightly brush the burgers on both sides with oil. Grill until no longer pink in center, about 5 to 7 minutes per side. Brush the burgers with the remaining mustard mixture. Serve open-faced with your favourite toppings. We are so proud to have the most wonderful team of nutritionist and staff at all 3 locations of Shulman Weight Loss Clinics– we wanted to introduce you to some of our key players! Each and every nutritionist at Shulman Weight Loss is dedicated to helping our clients lose the weight for life. With our unique approach to weight loss that includes one on-one care – our clients lose the weight for life. Click here to view some more of our before and after pictures. If you would like to book your free weight loss assessment with Dr. Joey – please call 905.889.5326 or e-mailinquiries@shulmanweightloss.com for our Thornhill, Yorkville or London location! As a graduate with honors from the Institute of Holistic Nutrition in Toronto, Krissy is a Certified Nutrition Practitioner, also holding a Bachelor of Arts Degree from the University of Western Ontario.